This story will feel familiar to many readers, and some of them will find that oddly disconcerting. There’s a famous Jewish folk tale: A man’s coat is wearing out, so he tailors it into a vest and, as it gets even older, into a button. When that button finally wears out, he’s left with only the story. McGinty’s book reads like that folk tale turned inside out. 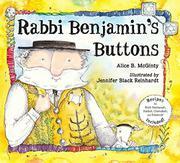 A rabbi’s congregation buys him a vest with beautiful silver buttons. Over the course of a year, the vest becomes more and more timeworn, and as the rabbi eats delicious holiday meals, the buttons pop off, first one at a time and then two at once. But there’s a surprise: The congregation has collected the buttons and sewn them onto a brand-new vest, even more beautiful than the old one. The inverted story is charming, if a little slight, but it may seem familiar for another reason. The use of language is often trite and sometimes mawkish. The expression “A happy congregation is the sunshine of my heart” appears with variations throughout the book. The book’s less sentimental readers may find they prefer the earlier folk tale. But Reinhardt’s watercolor-and-ink drawings are strange and captivating. The rabbi’s beard seems to point in two directions at once.